Oh, you are a very poor soldiera chocolate cream soldier!  1894 Raina toThe Man. Arms and the Man, act1.  Ch. 15, "The Chocolate Room"
 Further explaining the previous remarks. Since the appearance of Impressionism, the official salons, which used to be brown, have become blue, green, and red... But peppermint or chocolate, they are still confections. Augustus: I'm Augustus Gloop. 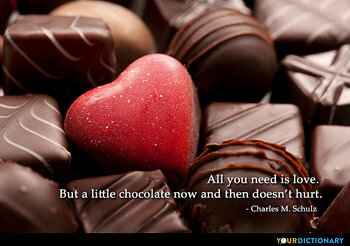 I love your chocolate. Willy Wonka: I can see that. 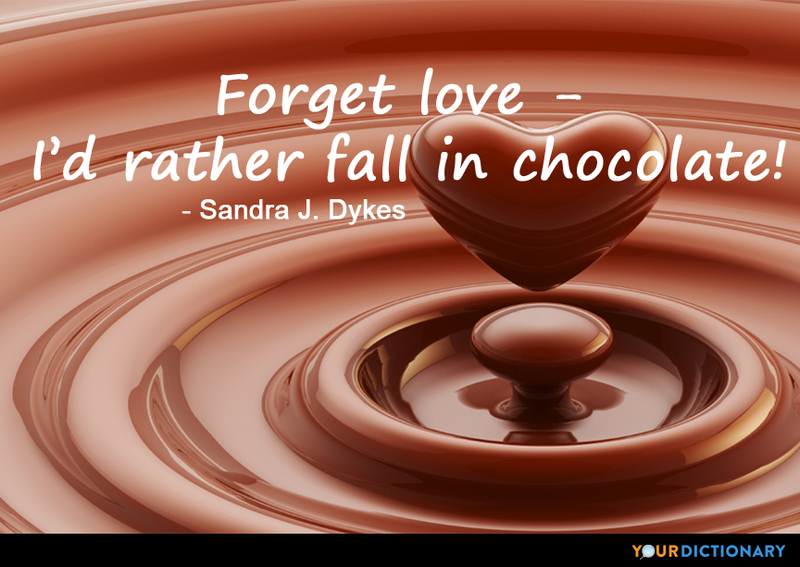 Love, biochemically no different than consuming large quantities of chocolate. I'm not allowed to have chocolate before dinner.  Before dying as a result of multiple time jumps. Her mind had been scattered by the jumps, and she was saying many random things from her past before dying. From Lost, episode 5x05 "This Place is Death"
True freedom is not a freedom of choice made from a safe distance, like choosing between a strawberry cake or a chocolate cake; true freedom overlaps with necessity, one makes a truly free choice when one's choice puts at stake one's very existence one does it because one simply "cannot do it otherwise."  Slavoj Žižek, "The True Hollywood Left" (2007).